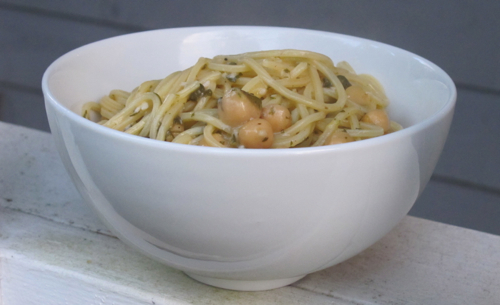 A quick dinner that ended up working well – Ford ate half the pot, so if the teen keeps eating I know it was a success…..
Bring a large pot of water to boil, add the spaghetti and cook for time on package, drain. Meanwhile heat a large skillet over medium heat, add the oil and garlic, cook for a minute. Whisk in the flour and cook for a couple of minutes. Whisk in the broth, bring up to a simmer, then let simmer on medium for 10 minutes, whisking often. Add the parsley, pepper and beans, let heat through, then add the lemon zest and juice. Turn to medium-low, add in the pasta and toss to coat, along with a good handful of cheese. The sauce thickens upon standing.